I’m super happy that the ‘Rebels Issue’ of Official Bespoke carries two of my latest features – the first pictured above profiling Damen’s unique yacht support vessel Power Play, and the second interviewing the wonderfully enigmatic Emily Penn of eXXpedition. If you have a rare five mins to indulge in a little light reading, I highly recommend this awesome publication. It prides itself on saying it how it is, good and bad, and leaving all superfluous gloss to the laminate on the front cover. The second press release written for Dutch innovator VRIPACK marks the beginning of a wonderfully collaborative and enjoyable working relationship. And what better way to kickstart the proceedings than with an SUV of the seas – M/Y ROCK is the yachting industry’s first ever pocket rocket! Read the full story here. The end of 2018 is just days away, and what better way to celebrate what has been a fantastically productive year than with the launch of the December issue of Simply Abu Dhabi which carries a mega 11 features written by myself. It also marks the first issue with my new dedicated yachting section. May 2019 be equally as fun and fruitful with myriad new discoveries and achievements. Happy Christmas to you all, and to all a good night! Monaco Yacht Show 2018, what a whirlwind experience that was. From award-winning design to innovative propulsion, the myriad of advances within the yachting industry was proudly on display. Being in the thick of it as a freelance writer and editor is a privileged place to be. Taking it all in from my unbiased perspective enables me to see the multi-faceted dimensions of the yachting industry as a whole, not to mention stepping aboard all manner of vessels represented by a global community of shipyards, brokerage houses, designers and suppliers. This was my eighth Monaco Yacht Show – it never fails to impress. Taking a tender to work will always be my favourite mode of public transport too. And the added bonus of a Red Arrows fly by this year was the cherry on the cake for me. Charter exclusives: read all about it! It’s been a bountiful few weeks when it comes to my charter reporting for Robb Report. From the latest and greatest served up by the world’s biggest brokerage houses to new start-up Ahoy Cub – a digital platform that makes chartering yachts more accessible. From old school to new age, there’s something for everyone, all neatly presented online. It’s live. It’s clean. It’s a Fairline dream. The new Fairline Yachts website, which showcases the Targa range, Squadron range and much anticipated F-Line, has gone live and looks stunning. Designed by digital agency Shotgun Front, and copy written by myself, the fluid, user-friendly website lets the yachts speak for themselves. It’s been a pleasure to be involved in this project. A doe-eyed polar bear, festive winter snow, and the coolest articles out there – what more could you want from the latest issue of FRASER magazine? Hot from its launch at the Monaco Yacht Show, you can ‘read all about it’ in this jam-packed issue. 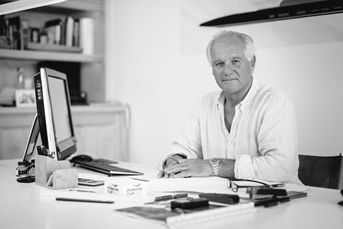 I am delighted to announce that I have been appointed as Editor on an exciting new book project working with the incredibly talented and exuberant superyacht designer, Ed Dubois of Dubois Naval Architects. Taking inspiration from the classically beautiful sailing yachts that Ed has made his name designing over the past 40 years, the book is set to be a hugely exciting and adventurous project to work on, and I feel greatly privileged to be invited on board. For the meantime, however, it’s yet another case of ‘watch this space’!